1. This coupon code is valid at www.popularonline.com.my only, from 15 March to 15 April 2019. 2. 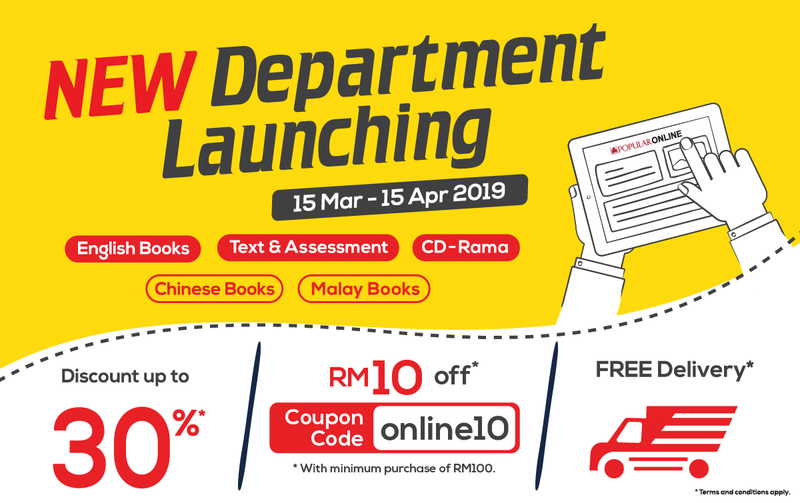 This coupon can be used to purchase any product from POPULAR Online with a minimum purchase of RM100nett in a single transaction. The payment amount displayed on the checkout page shall be the final product pricing. 3. This coupon is not useable with other Coupon Codes. 4. Key-in Promo Code “online10” in the “Coupon Code” field at the checkout page. Next, click “APPLY CODE” to enjoy rebate. 5. Each user is entitled to one (1) promo code only. This code is not replaceable if order is cancelled or product is returned after using the promo code. 6. No extension will be granted beyond the expiry date. 7. POPULAR Online reserves the right to amend or delete the terms and conditions of this voucher without prior notice. 8. Free delivery is only applicable to domestic shipping within Malaysia. Overseas delivery fees (e.g. Singapore) are subject to the shipping charges displayed on the checkout page.